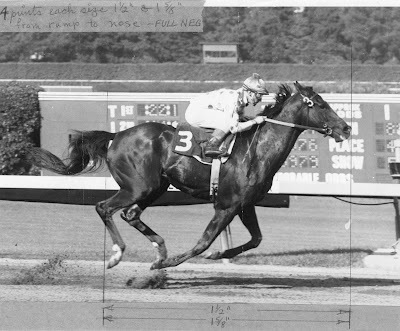 This is very personal, but 51 years ago Native Diver ran his last race before succumbing to colic 9 days later. That race was the Del Mar Handicap--then run at 9F. He carried 130 pounds and won by over 4 lengths wire to wire in 1.46.4. At 8 years old. In July he won his third Hollywood Gold Cup, 10F in 1.58.4. He is now re-buried at Del Mar and shares space with Shared Belief, I was at Del Mar on Labor Day and went out to say "Hi" to both. Ran hard, sleep well. Gone but not forgotten. Certainly one of the best to ever run on the west coast, maybe even this country. I still have his Breyer model.